Here’s something that is certain: California has a growing green economy. Want proof? Check out an updated, first-of-its-kind map compiled by Environmental Defense Fund that features 3,500-plus entities providing green solutions or using sustainable practices to improve their bottom lines. The map is searchable by seven categories and by county and state legislative district. California’s naysayers often claim that we should slow down our progress on clean energy and clean air because the overall economy is struggling. The truth is that the green economy is a bright spot, generating jobs, investment and business growth. The Green Innovation Index shows that green jobs have grown at 10 times the statewide average since 2005. Earlier this week, Ernst & Young said that in the second quarter of this year, $1.5 billion was invested in U.S. clean tech companies–an increase of nearly 65% from a year ago–and that 75% ($1.12 billion) of the funding went to California businesses. With the influx of jobs and capital, the green economy’s footprint is getting wider and deeper across our state. Case in point: EDF’s map shows that California’s green economy reaches every major metropolitan area. Los Angeles (489), Orange (275) and Santa Clara (265) counties have the most businesses in the map’s five sectors: low-carbon energy; energy efficiency; transportation; green building and carbon market. Mid-size and smaller cities are also benefitting, as evidenced by the number of green companies in Fresno/Tulare (43), Chico (28), Santa Cruz (36) and Truckee (10), to name a few. This map brings to life data that can be found in a recent report and study released by Lawrence Berkeley National Lab and California’s Employment Development Department. On the jobs front, Lawrence Berkeley National Laboratory released data showing that approximately 380,000 people are employed in the energy efficiency services workforce sector– a byproduct of state actions to reduce energy use. It expected this number to increase to 1.3 million by 2020. The Employment Development Department released data showing that more than 50,000 businesses can be classified as green because they engage in green practices or provide green products and services. 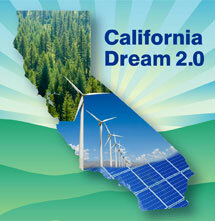 All told, these materials provide the latest snapshot of the strength and diversity of California’s green economy. In a time when economic recovery is job number one, it’s clear that California’s leadership on energy and climate change policies are fostering innovation and entrepreneurship across the state and helping California compete in the clean, green economy of the future. This entry was posted in Clean Energy, Climate, Jobs. Bookmark the permalink. Both comments and trackbacks are currently closed.